I am excited to share that I have been selected as a 2018 Drawing & Printmaking Fellow by the Massachusetts Cultural Council. Click here to read the announcement. Read my August 2017 profile in The Daily Hampshire Gazette. 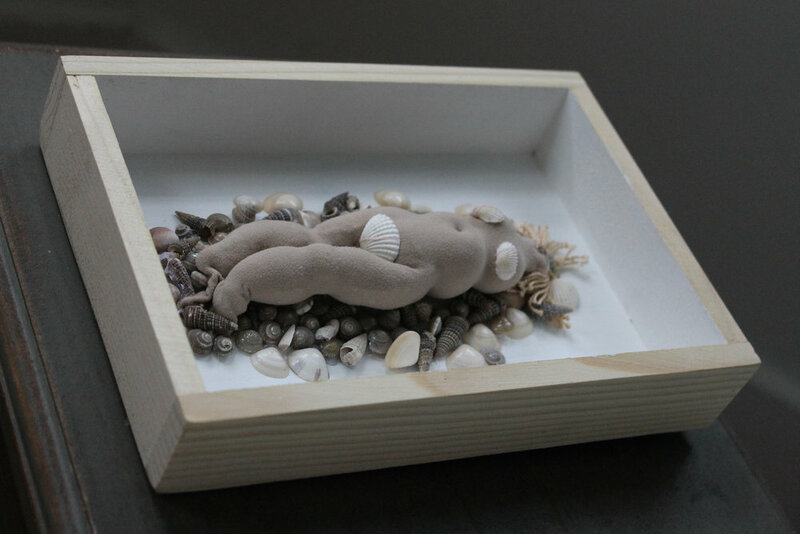 A Little Shell Island: Danielle M. and the Prison of Demure, 2017, wood, nylon, shells, 7"x9"
Read the New York Times preview of Here for the Right Reasons, a group show I took part in at Sleep Center Gallery in Chinatown, NY, curated by Janie Korn and Artie Niederhoffer. My piece, A Little Shell Island: Danielle M. and the Prison of Demure, was displayed alongside an original poem. Read the Paradise City Press write-up on Fugitive Arts' 2x3 Residency in A.P.E. Gallery. The project, organized by Esther White and Trevor Powers, centered on a photocopier and the theme of generative artmaking. As a 2x3 resident artist, I had the opportunity to be the first person to sleep in this gallery space.